In those days, things were so different… or not! Get great statesman and patriot Benjamin Franklin’s quotation, one of our 24 special 300-year Tercentenary commemorative designs. 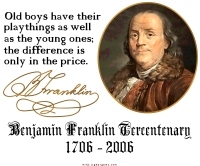 It features Franklin’s portrait and signature, along with the quote and Tercentenary dates inscription. Buy it now on a t-shirt, sweatshirt, hoodie, mug, tote bag or other quality apparel or gift item for yourself or your favorite Ben Franklin fan.